Chico’s GF Jeans + Ruffle Top + Tassel Necklace! Chico’s is hitting it out of the park this summer! 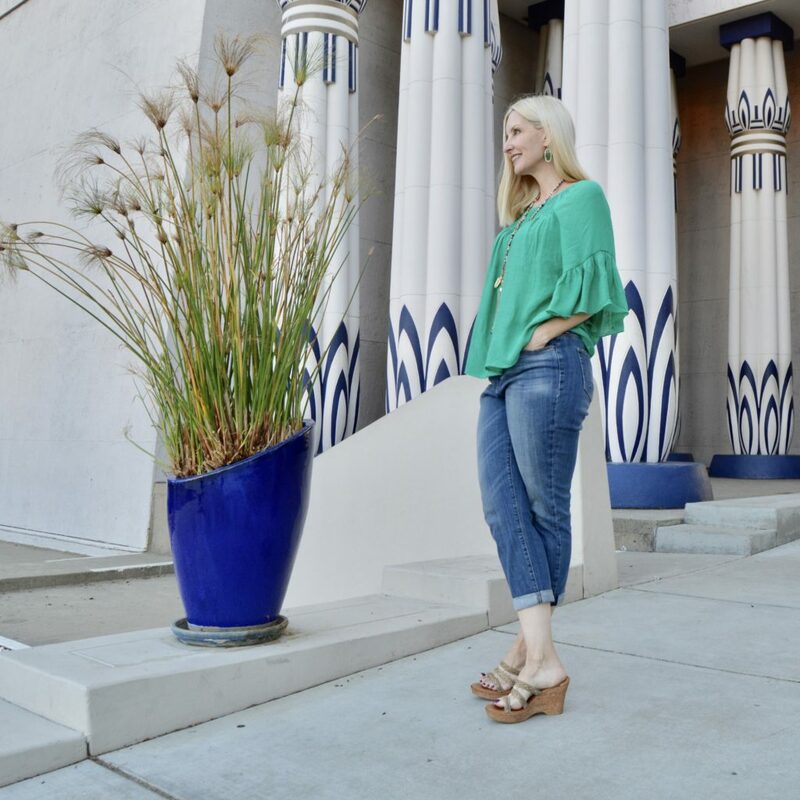 Take these comfortable flattering So Slimming GF jeans, add the Ruffle Slub blouse, and the trendy fun Halogen Tassel necklace and viola, you have the perfect summer look! I’ve really been wanting to try the Chico’s So Slimming Girlfriend jeans. 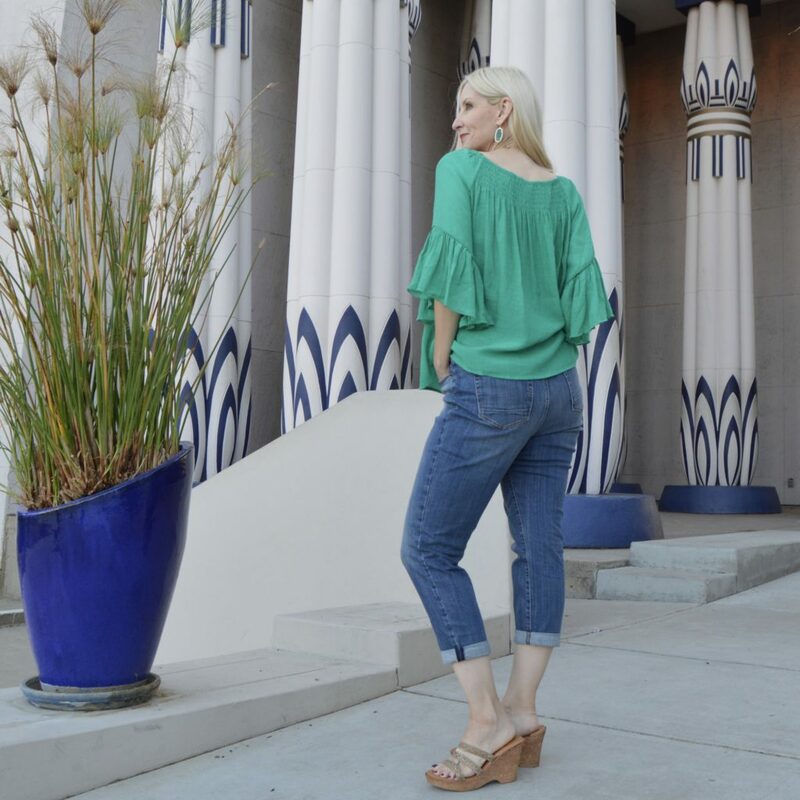 Comfortable jeans that are slimming? Sign me up! And looking at these photos, these jeans really are flattering and slimming, aren’t they? Plus they’re stretchy and oh so comfortable! I bet I’ll be living in them this summer! 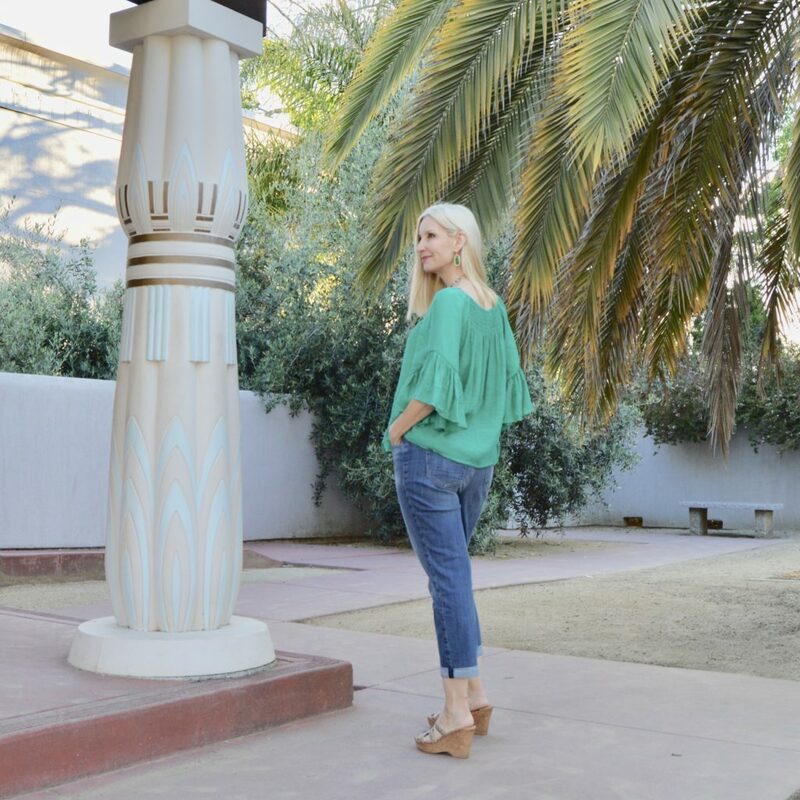 The top is the perfect easy breezy summer blouse. The trendy ruffle sleeves are so cute! And how beautiful is this Congo Green color? It also comes in four other pretty colors, including a delightful vibrant pink. I know I’ll be wearing this top soon with my gauzy maxi skirts. 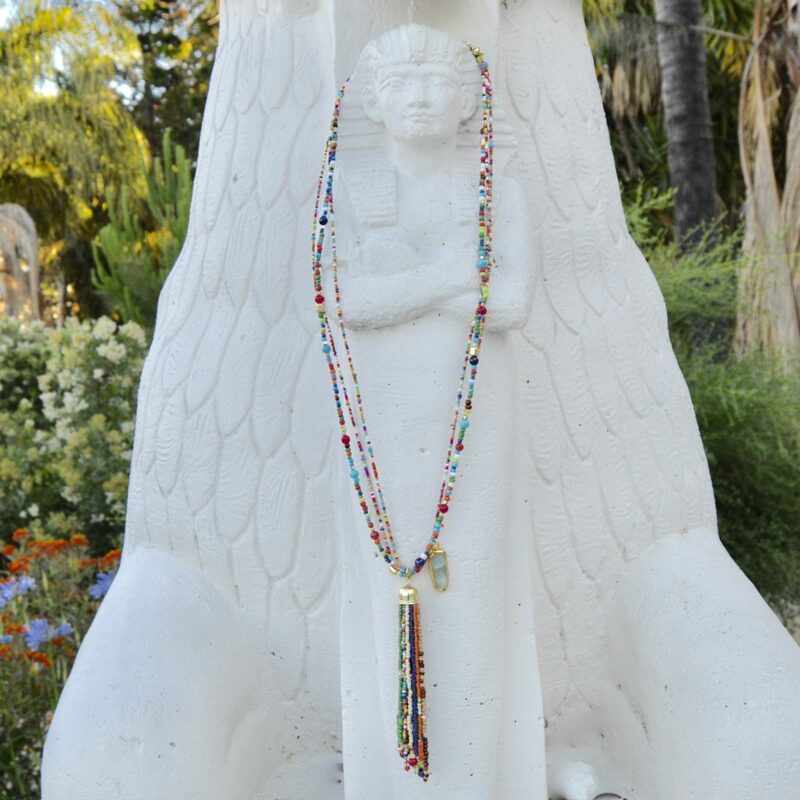 I love this special necklace and with a rainbow of colors, it will go with just about anything. And you know I love that boho vibe. Hope everyone is having a wonderful week! Wishing summer would slow down and last forever over here! Those jeans are so flattering! I love the pretty color of the top too! Thanks, Megan. The jeans are super comfy too! Loving greenery on you my friend. I have been meaning to try Chico’s. That blouse and necklace both have the pretty Summer and Bohemian vibes going. 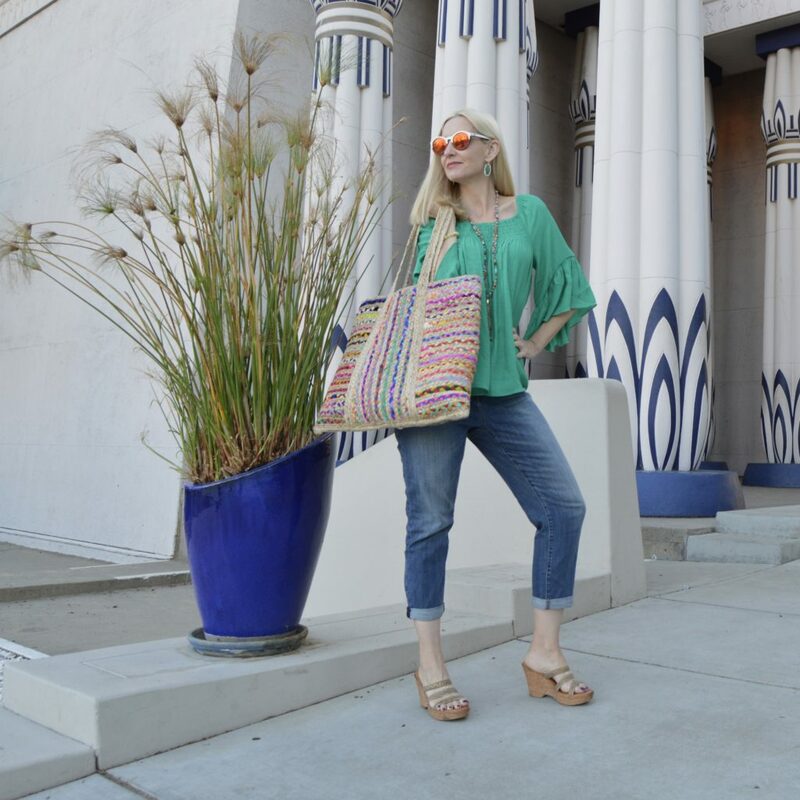 Love the sunnies, earrings and large tote too. Welcome by Thursday and linkup dear Dawn Lucy! <3 Ada. I’m really loving Chico’s! Give it a try, Ada! This top would be adorable on you. This outfit is so cute!! I am in love with that green top, love how you styled it!! Thanks, Cathy. I’m loving this shade of green! Love this color on you! Wow, the green top is so pretty and the earrings are a perfect match. 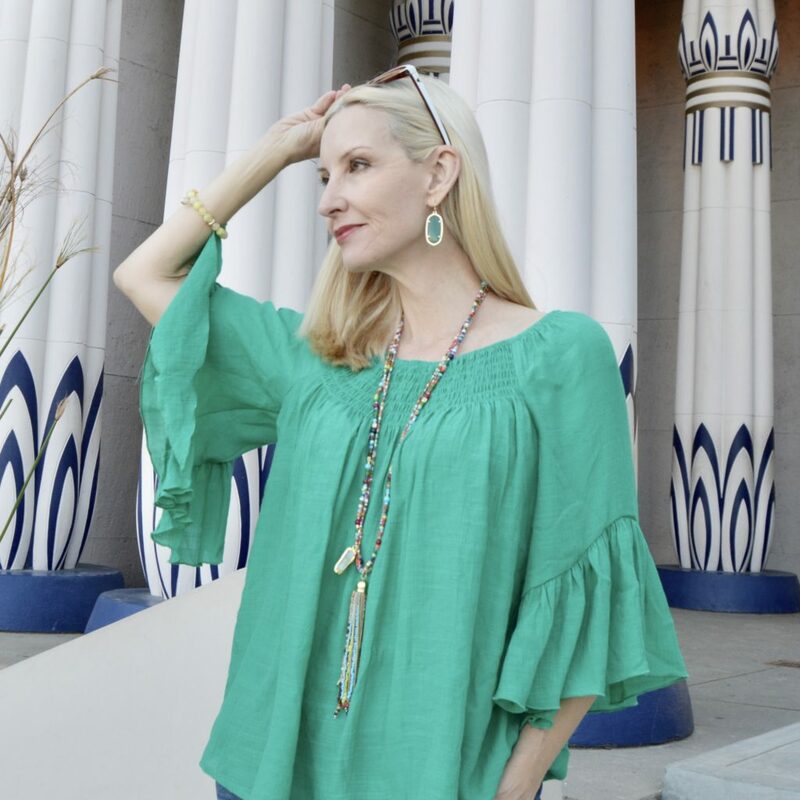 Love the green boho blouse on you. The whole look including super skinny jeans works so well. Wow I love the shade of green in this blouse! Gorgeous light airy top and those jeans are just the cutest! You pretty much knocked this one out of the park! LOVE that top! 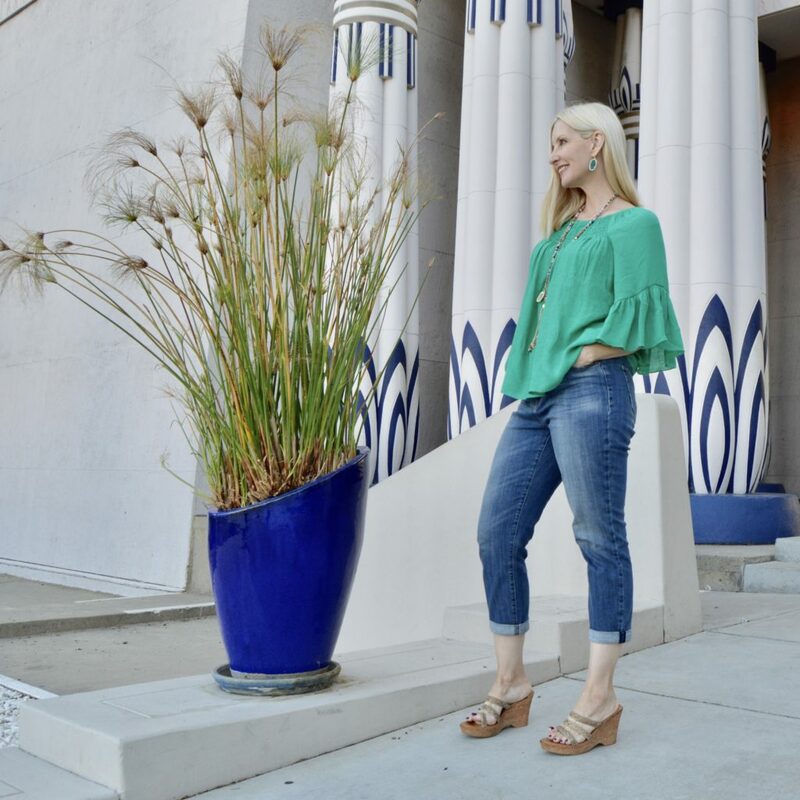 What a great way to wear the ruffle trend for over 40! Great post. 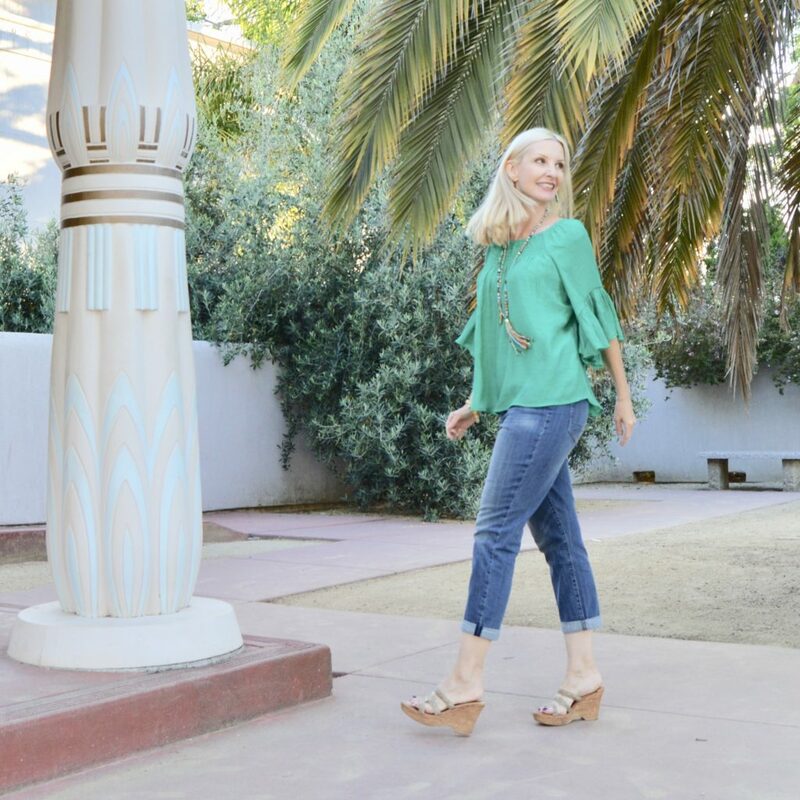 I love the necklace, and those jeans are super flattering… and I think Chicos is having a pretty good sale right now, so… The green looks fantastic on you too! The blue and green color combination looks great on you. Thanks for linking up to Top of the World Style. Oh my goodness that necklace is too cute! I haven’t been into Chico so long! We actually have one here in town and it used to be one of my favorite stores to pop into. Cute pieces! 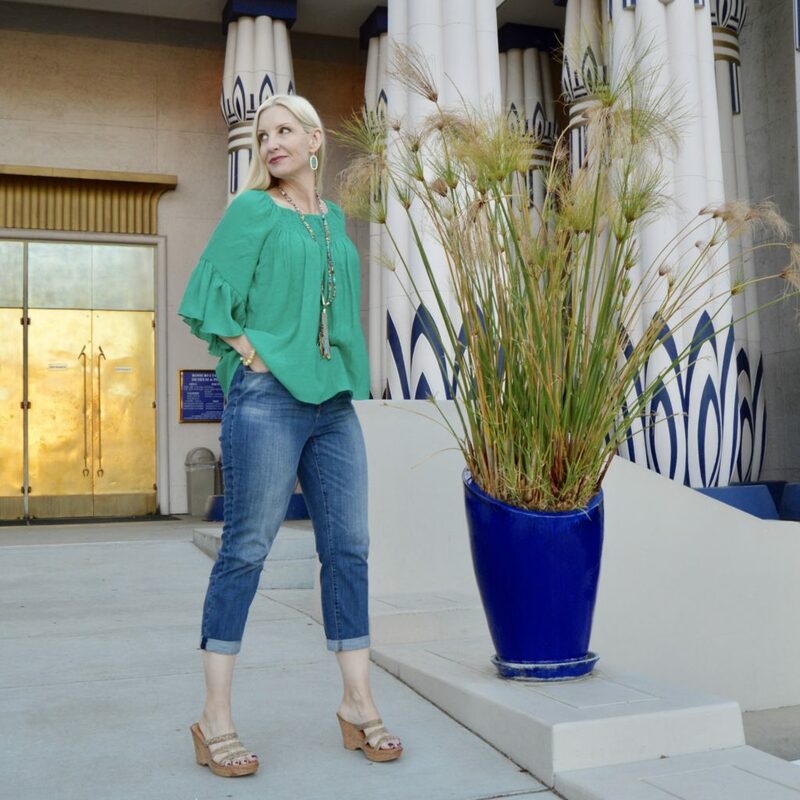 Thanks for linking with Ageless Style!